Pochettino: "We are going to see a different sport, not the football we grew up watching"
Mauricio Pochettino, not VAR's biggest fan over the last two seasons, did not hold back after Spurs' 1-0 win over Manchester City in the Champions League quarter-final first leg, with City awarded an early penalty for a handball on Danny Rose. Sergio Aguero missed the spot kick, but it did not stop Pochettino letting loose on the system, fearing: "We are going to see a different sport, not the football we grew up watching." Meanwhile, Porto were denied a penalty after Alisson had inadvertently pushed the ball onto defender Trent Alexander-Arnold's arm, as Liverpool ran out 2-0 winners at Anfield in their first leg. In the 11th minute at the Tottenham Hotspur Stadium, Raheem Sterling's shot from inside the box hit the arm of Rose, who had slid in just three yards away. There was little appeal, but after referee Bjorn Kuipers went to VAR, the penalty was given. The initial reaction was to think back to Manchester United's dramatic win in Paris last month against PSG, when Presnel Kimpembe was penalised for a late handball. That incident seems to have set a precedent, a reference point for fans if you like, and after replays were shown, the consensus was: penalty. Rose's hand was up as he slid in, and it did change the flight of the ball. Minutes later at Anfield, as Alisson went to catch a harmless looping ball at the byline, Alexander-Arnold went for the same ball, prompting the goalkeeper to bizarrely brush it towards his team-mate. Stood just a yard away, the ball did hit Alexander-Arnold on the elbow and out for a corner, and though VAR was called, no penalty was given by Mateu Lahoz. Not for the first time, Pochettino was strong on the use of VAR, despite his team winning. He said: "There is a lot of work to do with the VAR. I want to try to help the VAR and the system, to settle the protocol. But I think today showed the system still has a lot of work to do, there are many decisions where nobody knows if VAR is going to be in or not, are they going to check or not. "Maybe technically it is a penalty because it's handball, but still we don't know the protocol. There are a lot of question marks and work to do. "It's not going to be healthy for the VAR, or for the referees, it is going to be a big problem. I think it is going to change the spirit of the game, and I am worried, very worried about how we are going to work next season. "There are many, many things that we need to try to make clear. I think the direction of football is going to change, the spirit is going to change, we are going to see a different sport, not the football we grow up watching." Big words. So what are the rules? The important bit, so read carefully. UEFA's guidelines read: "Handball is the deliberate act of a player's hand or arm making contact with the ball. When deciding if it's handball, three magic things must be considered: 1. The movement of the hand towards the ball and not the ball towards the hand. 2. The distance between the opponent and the ball - was it unexpected. 3. And the position of the hand. Just because it's away from the body doesn't mean there's an offence." A UEFA statement after Man Utd's win in Paris, where Diogo Dalot's effort travelled five yards before hitting Kimpembe's arm, read: "Following the on-field review, the referee confirmed that the distance that the ball travelled was not short and the impact could therefore not be unexpected. "The defender's arm was not close to the body, which made the defender's body bigger thus resulting in the ball being stopped from travelling in the direction of the goal. The referee, therefore, awarded a penalty kick." Both incidents on Tuesday night saw the ball travel a short distance. Still: one penalty given, one not. The fact the Liverpool incident was not a shot on goal, and the ball was not heading towards the goal, will have gone in their favour. Again, the decisions seem inconsistent, but that may be down to the fact no two handballs are exactly the same. As we know, football is erratic by nature, and following strict rules for interpreting handballs may always be problematic. But is it different in the Champions League? UEFA warned at the beginning of the season that there would be stricter decisions made in the Champions League. Nevertheless, football's law-making body the International Football Association Board (IFAB) moved to clarify the interpretation of handball at its annual general meeting last month. Its position is that if the ball strikes a player's arm when it is extended beyond the body's "natural silhouette" then a penalty should be awarded. It also said that, from next season, goals scored or created with use of the hand - even accidental use - will be disallowed. Wait, what about the 'clear and obvious error' guideline? 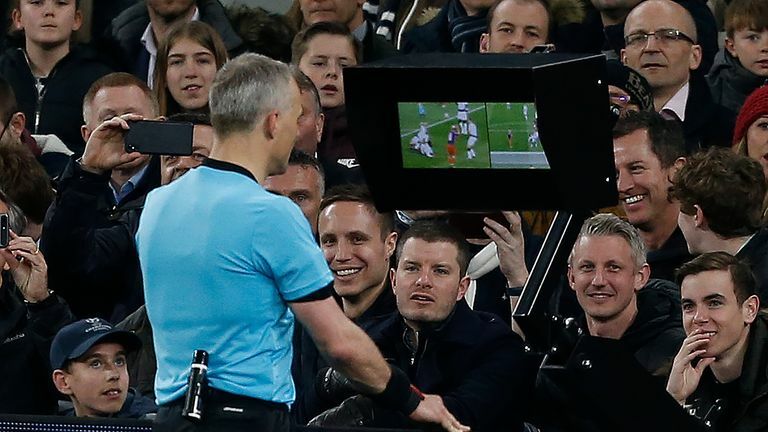 It seems VAR will be checking each and every instance of handball in the penalty area as a rule, rather than the 'clear and obvious' refereeing errors which VAR had first outlined. Will that be the case in the Premier League next season? The feeling is probably not, which will only serve to confuse more fans, players and coaches. Pochettino in particular sees a genuine problem with how VAR could impact atmosphere, as well as an increase in penalties awarded. And handball seems to be the biggest issue. Despite the governing bodies clarifying how i) distance from the ball, ii) height of arm, and iii) movement of the arm can impact the decision, we are still left with inconsistent decisions. f you're reading on skysports.com comment below to get involved in the debate, but please adhere to our House Rules. If you wish to report any comment, simply click on the down arrow next to the offending comment and click 'Report'.